Rescored from a 3/5 to a 1/5 after some thought. Hated the ending. Bennett does have a future ahead of him though. The setting of the story was its strength and that should of been focused more so than anything else. It has me wanting to read another series that has active gods in it. 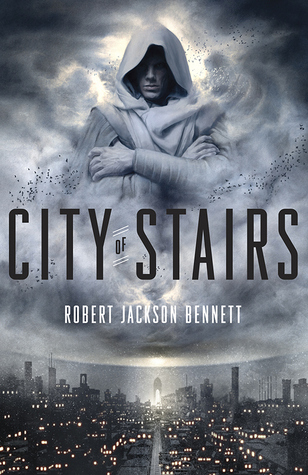 I’ve always enjoyed the idea of multiple gods with varying personalities, so City of Stairs intrigued me. However, the delivery fell short, but there were times when I really was enjoying the book. I was really into it at times but then it would just fall flat, become interesting again, and fall flat again. The ending felt rushed and the character's actions seemed unbelievable. I would recommend the book but I would let the potential reader know that it has a lot of short comings. Sign into Goodreads to see if any of your friends have read City of Stairs. 11.06% "First impression: Reminds me of a setup for an anime series. In fact I can't help but see the characters and Bulikov as anime characters in my head. When I read Saypuri I think it is a cat race in my head, lol. I am intrigued so far though." 26.55% "I'm hoping to spend a nice chunk of time today reading. The party scene was a lot of fun and the interrogation scene opened up some possibilities for the story. It was pretty expected tho." Glad to see a different take on the book since it is one of the most popular new releases of last year. I would not be suprised to see it being nominated for the Hugo.